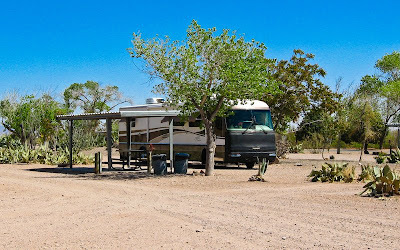 We arrived at Pancho Villa State Park in Columbus, New Mexico yesterday afternoon. What a neat place. We have really enjoyed the county and state parks on this trip. Not only are they reasonable but the rv sites seem to have more room. 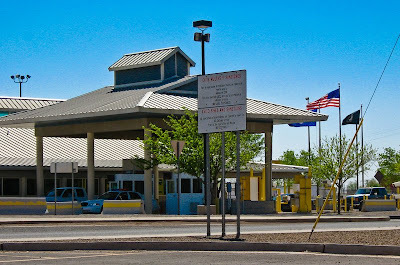 This morning with eager anticipation and passports in hand we got into the jeep and drove 3 miles south of the State Park to the border crossing at Columbus, NM / Polomas, Chihuahua, Mexico. The plan was to have lunch and do a little shopping. We parked the car in the parking lot on the US side and then went into the duty free shop. All the products in this shop are for export only. 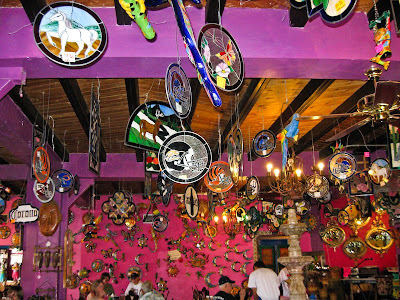 What this means is, anything in this shop that you buy has to be carried into Mexico and then brought back out. So, we walked into Mexico carrying a few purchases with us. We knew where we wanted to have lunch, at The Pink Store. Our friends Bob and Linda were here last month and recommended we stop here. With its pink exterior, the store was easy to find. This is part store, part restaurant that caters to Americans. In fact it appeared that the majority of the patrons were Americans. Store signs are in English and English is spoken and understood. We immediately felt at ease. 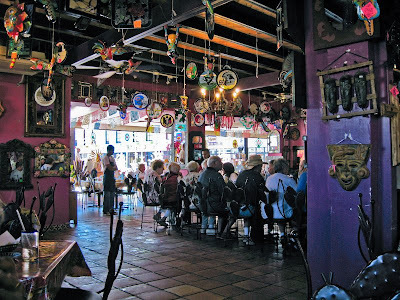 We had a wonderful, leisurely lunch of taco/ combo plate, chips and guacamole, and great margaritas while listening to some lively music being performed in Spanish. After lunch we did some additional browsing and shopping in the store. Judy wanted to purchase some more hot sauce like Bob and Linda had given us. No one seemed to know what hot sauce was. However someone finally said "Picante Sauce" and the mystery was solved. They didn't sell it at Pinks but suggested that the small grocery next door might. We left The Pink Store with our hands full. 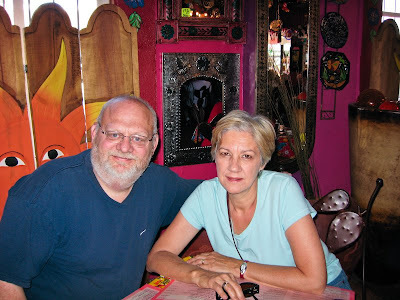 After finding the picante sauce at the grocery we were ready to head back to the border. Crossing the border back into the US was uneventful. We showed the border patrol our passports and then we walked back onto US soil. As we were walking back to our car 2 couples approached us. They wanted to know how difficult it was to cross the border and where we had lunch, etc. One couple was celebrating their 58th anniversary and the other couple was buying them lunch. The anniversary couple was from the Grand Rapids area. Imagine that!! On Sunday when we were fueling up in Arizona a guy came over to talk. He had seen our motorhome back in California and noticed the Michigan plates. You guessed it. He went to college at Ferris just north of Grand Rapids. While we were in the California wine country one of the people who served us at a winery had attended college at Cornerstone University, where Judy and I met. Makes us wonder if anyone is still back East. We were talking with our daughter Julie last night. She says she tells her friends that her folks are "Reverse Hippies". I like that. At lunch today we overheard someone making a toast. It went something like "may your wheels always be moving forward"
They must be fulltime Rving Reverse Hippies!!!! Looks like you are well-rested and having a lot of fun. We are expecting high 60's here today, so hopefully you'll be happy with the weather when you return. It's no dry heat, but it feels warm to us! The girls are eagerly awaiting the return of the reverse hippies. The only problem is, Emma thinks Nemo and Mia will be with you when we see you in a few weeks. I have no idea where she got that idea, but she'll be disappointed!